I'm a worrier by nature so, naturally, decisions aren't made easily. I HAVE to get other opinions and advice to help me make decisions - yes, even pointless things like 'shall I have this or this for dinner?' - but that isn't what I'm talking about, in this instance. Sometimes, it's so hard to make a decision and 'just go for it' - a phrase so many people have told me over the years, and still continue to, almost always followed with 'but what have you got to lose? - in relationships, in work, in ideas relating to your life. As I've said, I've just relocated for a new job; a job I love. I'm not exactly living in a place (the town, not house) that I like or want to be living in but, in this case, I just had to go for it because the positives of this job and the things it could lead to; they most definitely outweigh the negative reasons for being here. Knowing whether or not to 'go for it' - not always easy. If you're anything like me, you spend more time worrying about making the decision than actually just thinking rationally and taking that leap. I suppose I am in that situation now, but in a different aspect. I wrote recently a post about vulnerability for Alex Beadon's Feel Good Blogging Challenge. I touched on the fact that everybody, in someway, is vulnerable. We can feel vulnerable every single day about something - an idea you put forward to your boss, a new gym class you attend...allsorts. Sometimes you just need to know, is that vulnerability or that hesitance a gut feeling that something just isn't right or is it your brain talking you out of it? Again, not an easy decision BUT this is my point - sometimes you just need to go for it. One way or another, part of you will just know and even if it doesn't - what have you got to lose? We don't get to the places we want to get in life without making decisions that aren't right - or maybe they are just right at the time, but not right after a little bit of time. That's okay too! Making decisions that aren't right for you now, may lead you to things that are right and that do make you happy...or maybe, these things we jump in almost feet first for, well, maybe...just maybe, they will make you happier than you could have imagined. We cannot live our lives in worry or in fear of making a bad decision. Sometimes you've just got to put yourself out there, be positive and see if a 'just go for it' moment pays off. In 2012, I wrote a post about becoming a 'Yes Woman', inspired by Rosie's post. It took me a very long time to be able to actually deem myself that, but now I feel like I can. Travelling; I did it for myself, I made the most of experiences and said yes. Right now, I've eliminated some negativity in my life, said yes to a role I wanted and I'm just thinking 'go for it' and 'yes' to a lot of things now - including allowing myself to feel happy, settled and to feel like I do deserve great things. It's surprising how a few changes (teamed with a bit of yoga and meditation for that bit of calm and time out needed day to day) can shift your thought process and send your drive through the roof - making you feel more determined than ever. I'm not saying to jump in feet first with every single thing that crops up - that would be silly and you may find yourself causing more hassle and unsettled feeling for yourself! But I'm simply saying, not to always overanalyse or weigh up the pros and cons too heavily. We only get this one life, you don't want to be sat with your children or grandchild in 40-50 years saying 'I wish I had done that when I was your age'. 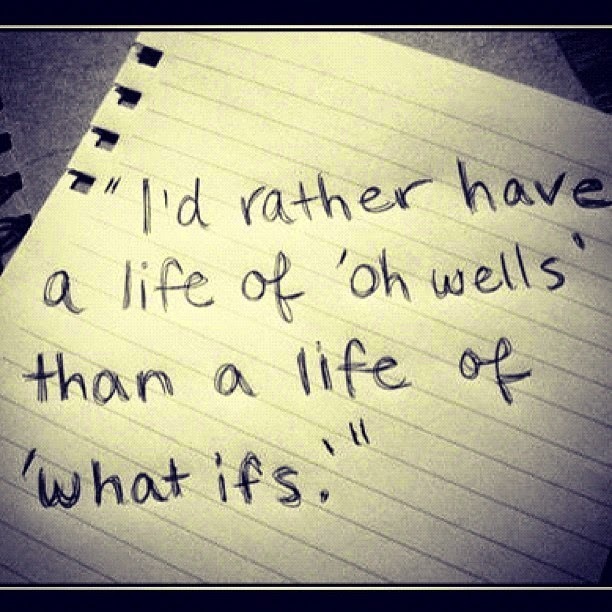 So a situation I have now found myself in - I'm just going for it. Laying my cards on the table, putting myself out there. So far it seems to be working. I've slowly learned to become a 'Yes Woman'; a 'Just Go For It' Girl...but first and foremost, I'm Natasha; the girl that could write a book on making bad decisions, learning from them, repeating them and having moments of epiphanies BUT I'm not going to be Natasha; the girl who bails or doesn't do things because she's worried about the bad things that might never happen. Hell yes! Love this post, I can so relate to this, I'm so with you. I'm like that with work, or even just blogger meet ups! Basically anything out of my comfort zone... My first reaction is to say "No" because it scares me, but then I make myself go and I have an awesome time or get something awesome out of the experience.